A year ago “Fleetwood” was anchored in Salt Run at Saint Augustine, Florida. 2007 Portsmouth, Va. 2006 Durban, S.A., 2005 Rabaul, Papua New Guinea. 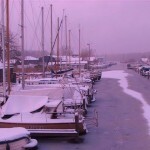 My brother in law, Herman, sent me the below photo of “Fleetwood” in her mooring at the “Schinkel” in Amsterdam. Last night I met with three of the “Taco Tuesday” one time “Singles Only” offshoot. 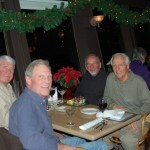 Started in the seventies by a number of single Gig Harbor sailors. At the inception I did not qualify. Now I am the only single member. Sixty Five years ago our mother was part of a group of political prisoners in a concentration camp annex of Dachau. I have a separate web page under item 9) ,or http://cometosea.us/?page_id=73, of a number of stories and facts of this period. This is a SPAM. I checked it out and it is apparently harmless. But best not to download anything. Anyway I thought that I share and warn you. I know that many of you use SKYPE. 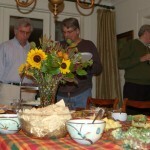 On Monday, the fourtheenth, I was Roger Rue’s guest at the quarterly meeting of the Cruising Club of America (CCA). The meeting was held at the Seattle YC. Roger was in charge of the meeting program and had a US Coast Guard representive scheduled to speak. He had an accident on the icy roads that morning. I substituted, impromptu. It was fun. Great bunch of sailors. Last Wednesday I had a couple pre-cancerous spots removed from my nose. From now on I will wear a wide brimmed hat and use sun screen, in the sun. This Wednesday my right foot will go under the knife to remove arthritis built up on my toe bone. This will make it more pain less to walk. I’ll be doing lots of walking travelling through Indo China in the next three months. Yesterday I came back from a three day trip to Bellingham and Vancouver to see a number of friends. This morning Rose Marie, daughter #2, and her family unwrapped Christmas gifts. I attended 8.45 mass at St. Therese. Practiced with the St. Nicholas choir in the afternoon. It will make my Christmas eve special, a fine group of singers and great program. 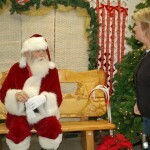 Then Jim O’Donnely, the Sinterklaas/Santa Claus on my previous posting, invited me over for a gathering at his house. Jim is married to a comtemporary Amsterdammer. There were a couple more Dutch couples from Gig Harbor who I had never met before. The below picture was taken in the train coming back from Portland. This is the old, so called “Galloping Gerdie” which collapsed in the 2nd WW due to a design error and the additional bridge that was readied in 2006. 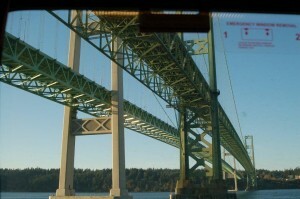 It connects Gig Harbor with the east shore of the Puget Sound. It does not happen very often that St. Nicholas Day falls on a Sunday. 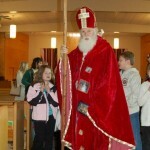 My parish in Gig Harbor has been St. Nicholas since I moved there in 1984. 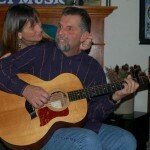 Jim O’Donnell made a foray into Amsterdam from a stint in the US Military in Germany and charmed an Amsterdam lady into following him back to Gig Harbor. She bought him a genuine Dutch Sinterklaas outfit, he grew his beard and he has been charming the yougsters on Saint Nicholas day ever since. He wears a regular Santa Claus suit underneath the Sinterklaas outfit and then does double duty, having the kids take their pictures with Santa Claus. Zaterdag 5 december, wie de koek krijgt wie de gard? Geen koek van mij. Ik voel me helemaal verwaarloost. Ik hoor niets meer uit Holland. Drijft de boot nog? Leven mijn familieleden, vrienden en vriendinnen nog? Wij vieren zondagavond hier Sinterklaas. Met de Sinterklass speculaas pop en amandelstaaf die nicht Connie me bracht. Sinterklaas komt ook zondag na de mis in Gig Harbor in de Saint Nicholas kerk. Het komt in de komende dagen niet boven het vriespunt hier. AMTRAK is actually getting it’s act together. I had sworn to never use the US rails after the 2007 experience from here to Alameda and back. Now the train was on time, comfortable, greater frequency, inexpensive and very enjoyable. Today it was a cold crisp sunny winter day, the view riding along the Puget Sound with the snow capped Olympics was breathtaking. Seth picked me up at the Portland station on Saturday, Carly joined us later at their home in Beaverton. They live in the rural outskirts of the town on a large lot with a big shop behind the home they rent, where Seth can work with his tools and toys. Evert Slijper came to get me after Sunday’s services at St. Cecilia and drove me to their home in Eugene. I met his wife Judy for the first time. 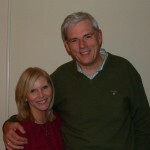 Evert and I have known each other since 1973. Evert visited me at “de Schinkel” in Amsterdam last August. He knows the club and several of the members well. Sunday evening the three of us had dinner with Joan Rippe and her new partner Mark Mooney. Joanie and I became friends in Papeete in July 2005. Some of you on the “Lisa List” will remember the intensity we all shared with Joanie when her daughter Maia went through leukemia treatment in 2006/2007. She recovered, I believe, in part through your prayers. Eugene used to boast more sawmills within it’s town limits than any other. In the seventies and early eighties I spent much of my timber purchasing life in Eugene. Much has changed. A walk through memory lane. Monday evening the Slijpers invited a dozen of their sailing friends over to see my slide show of the circumnavigation. Tuesday morning I took the AMTRAK back to Portland. Mike Parr and Vicky Onouliak, friendships from my wood career, took me to lunch in the Goose Hollow Inn, a Portland land mark and great food. I took the train later in the afternoon from Portland to Centralia ( about half way from Portland to Tacoma). This is where my oldest granddaughter’s dad and grand parents live. I had not had a chance to see them for a few years. Another lumber years long time friend, Jim Wilkinson also lives in Centralia and we caught up on each others latest news and Jim gave me a run down on our industry. The wood products industry has taken harder hits than any prior recessions. Many mills and sales organizations have hit the (saw)dust. I stayed the night at the Olympic Club Hotel. 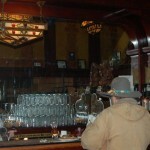 A 100 year old hotel, pub and theater with a colorful wild west history. In the pictures below you can just imagine that you are looking at John Wayne starting the day with the beverage of his choice at the magnificent mahogany bar. A few blocks away, Corrine’s dad showed me his house where he is the 6th generation proprietor of the same home. 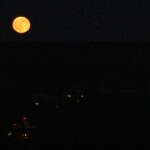 I got back in time at Lisa and Harry’s home to see the moon rise over the Cascade Mountains. This Oregon visit was another vacation from a continuous vacation that was filled with the warmth and love of so many lasting friendships. I am so very fortunate and grateful.